Opened in 1823, the Plymouth & Dartmoor Railway (P&DR) was built to improve economic prospects around the remote moorland community of Princetown in Devon, promoted by a philanthropic landowner called Sir Thomas Tyrwhitt. It was a toll route, run by independent carriers using horse-drawn wagons and eventually incorporating a couple of branch lines. Construction costs significantly exceeded initial estimates and the predicted agricultural development on the moor didn’t materialise. As a result, in its early years, the company’s finances were perilous. It did however carry large quantities of granite and china clay to Plymouth, and prospects improved in 1865 after the company was reconstituted. In 1878, the Princetown Railway took over the upper reaches of the P&DR, relaying and realigning the route for standard gauge trains. Thereafter, the Plymouth & Dartmoor only operated a branch from Lee Moor to Laira where a wharf and interchange arrangements with the Great Western Railway were sited. On 2nd August 1883, the P&DR obtained Parliamentary powers to build a branch to Turnchapel, in Plymouth’s south-eastern outskirts. 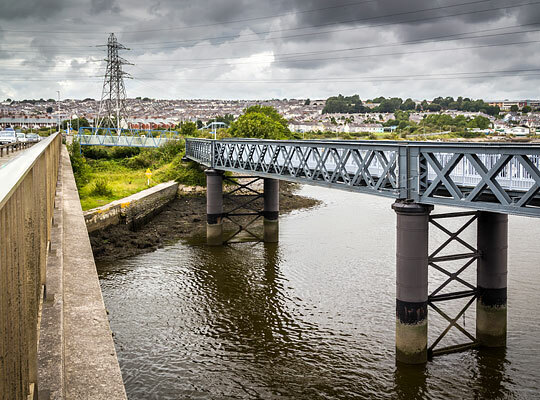 It involved crossing the Laira, the name originally given to the southern reaches of the River Plym estuary. 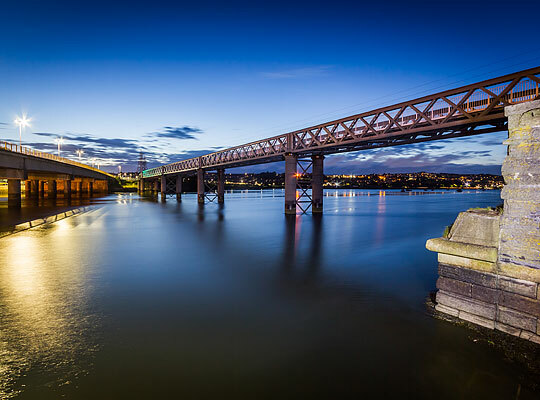 Designed by Messrs Galbraith & Church, the structure cost around £31,000 and extends for 213 yards at a height of 26 feet above high water level. At its western end is a curve to the north of 10 chains in radius; the gradient throughout is 1:66. It features six spans and took exactly a year to construct, completion coming in November 1887. This was however later than anticipated as a result of the limestone bedrock being 40-80 feet lower than expected. 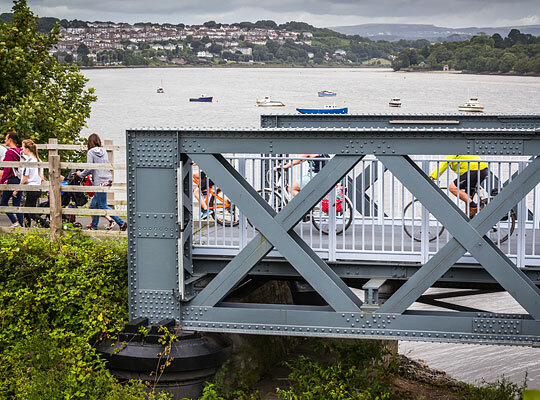 The piers were aligned with those of the adjacent road bridge to ensure no interference was caused to river traffic. They comprise pairs of horizontally-braced wrought iron columns - 8 feet in diameter at the bottom, 5 feet at the top - formed of 3-feet deep cylinders and filled with mass concrete. The material encountered in sinking the columns was typically 22 feet of sands, 5 feet of shells (mostly oysters) in black sand/mud, 50 feet of stiff blue clay/mud and 2 feet of gravel/stones. 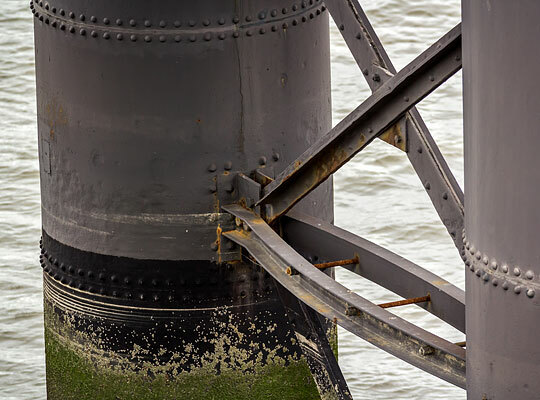 This offered stiff resistance, even with 100 tons of iron loading the columns. But the sinking was rapid when it eventually yielded, on one occasion being recorded at 42 feet in four seconds for 14 cylinders. Dredging operations were also resorted to, resulting in part of a deer’s antler being unearthed 50 feet below the surface. 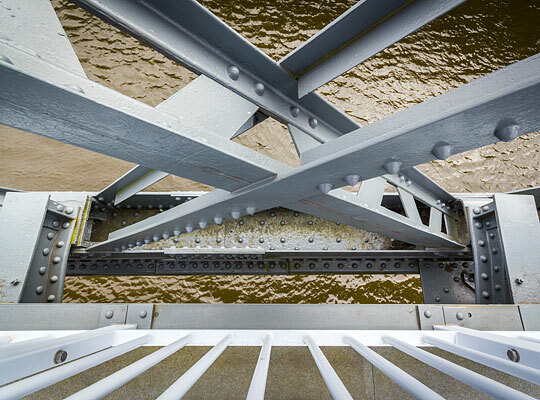 Each of the spans comprises two double-intersection Warren trusses, with trough-girder chords top and bottom, and 12 tension and compression diagonals. The width of the deck is 20 feet. 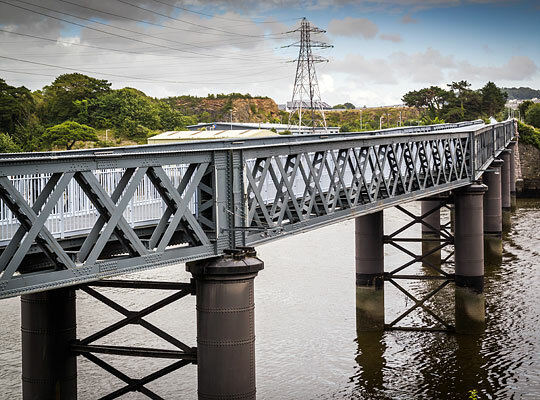 The ironwork - all 750 tons of it - was manufactured and assembled by Head Wrightsons from Stockton-on-Tees, sub-contractors to Messrs Relf & Pethick of Plymouth who built the railway. 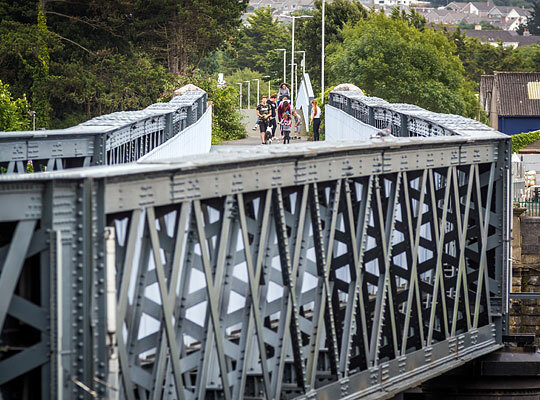 An inaugural passenger train crossed the bridge on 5th September 1892, pulling into a terminus at nearby Plymstock. Thereafter the London & South Western Railway took over the powers afforded by the Parliamentary Act, constructing the remaining section of the Turnchapel branch which opened on 1st January 1897. 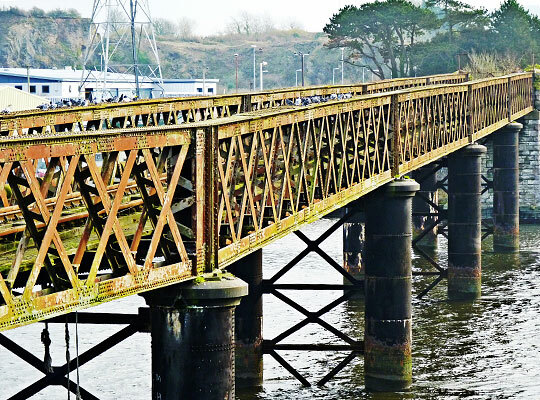 A year later, the Great Western Railway also secured an agreement to run across the bridge in order to access to its branch to Yealmpton. 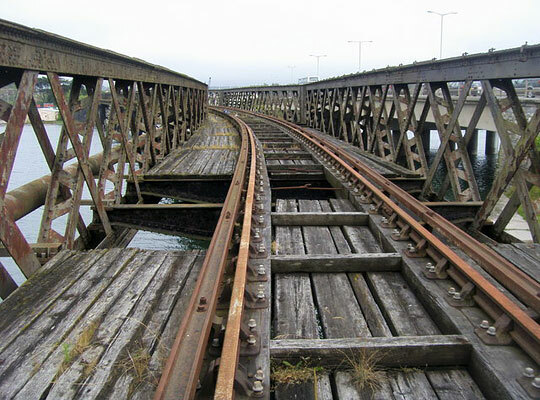 Closure claimed these two lines in 1961 and 1960 respectively, however the bridge remained operational as part of a spur which served the nearby Associated Portland Cement Works. It was finally taken out of use on 13th September 1987. 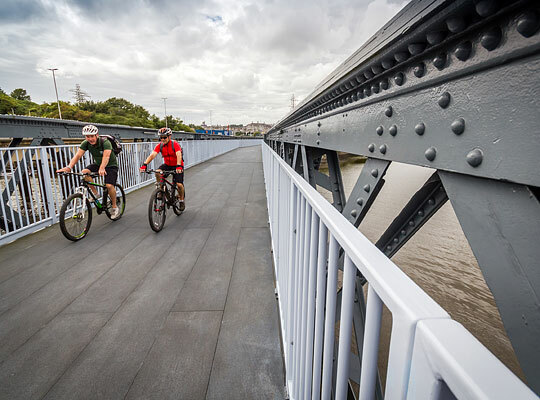 In 2014, it was announced that £3.5 million of funding had been secured from the Government’s local sustainable transport fund and a housing developer to transform the redundant bridge into a foot and cycle path. 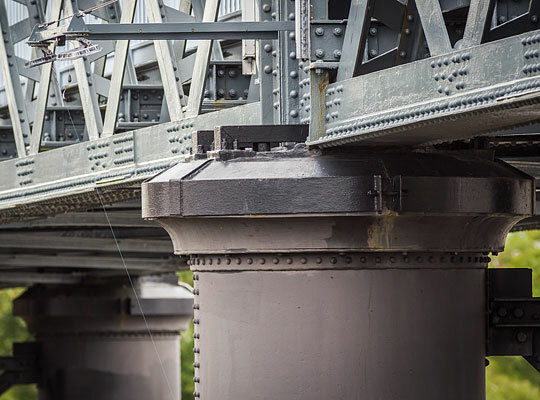 Undertaken by Taziker Industrial, the works involved encapsulating, grit-blasting and painting the bridge, as well as the fitment of strengthening collars to cracked cast-iron pier caps, replacement of some bracing members and the installation of GRP deck panels. The works were phased from east to west, ensuring that loadings from the access scaffold remained within appropriate limits. The cycle path opened in August 2015.